Dr. Du, an assistant professor, had taught undergraduate Pharmaceutics/Biopharmaceutics courses in the Zhejiang Collget of Traditional Chinese Medicine for nine years before his persuing of Graduate Study at Yale and University of Tennessee. Dr. Du joined the faculty in Hampton University in 1999 and has been the course coordinator and lecturer for the Pharmaceutics/Biopharmaceutics Course and has taught various selective courses. 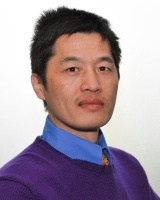 Dr. Du's research interests are in the area of pharmaceutical proteomics and drug metabolism. He has several funded research projects. One of his research projects was funded by NIH/NIDA to study human metabolism of illicit club drug MDMA (Ecstasy) using HPLC coupled with tandem mass spectrometer. Dr. Du has published a number of peer-reviewed research papers in renown scientific journals and has presented his research findings at several international conferences.